UPDATE: Owen’s comment pointed me to WordPress Admin Dashboard replacement which apparently adresses some of the issues I’m pointing out. 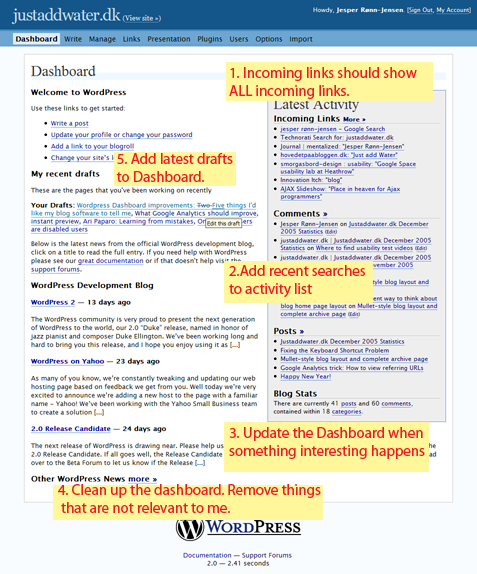 The top left section “Welcome to WordPress” contains a brief overview for the most relevant actions to administer the weblog (write a post, update profile, etc.). This is added from version 2.0 and works well as an appetizer (especially for newbies). “Latest activity” is a good headline that immediately gets my attention. I can see things happening: posts, comments, incoming links. Very good, as I think this sums up what I’d like to know from a dashboard-view. However, I don’t think that “latest activity” contains what it should to give me the complete overview. Incoming links should show ALL incoming links. The dashboard already has a box labeled “incoming links”, but it doesn’t show any referring URLs. Referring URLs (or link referrals) are registered by a browser as the page that link to the current page. In my opinion, referring URLs are of great value, as we want to know who link to us and how users get to know our website. I recently wrote that even in Google Analytics this feature is hard to find. “Incoming links” should show both trackbacks AND referring URLs. Most browsers send information as HTTP header “Referer” when they request the page. Add recent searches to activity list. What are people searching for on my blog. Luckily we have a web-server access log that can tell me, but it requires digging and parsing a file on a regular basis. The dashboard has information recent trackback links and comments. It would be appropriate to add a list with recent searches. Update the Dashboard when something interesting happens. Ajax calls to the web server could keep “Latest Activity” up-to-date whenever a comment is posted, searches and trackbacks are performed. Also the display could update when my partner posts a new article on the site. Clean up the dashboard. Remove things that are not relevant to me. 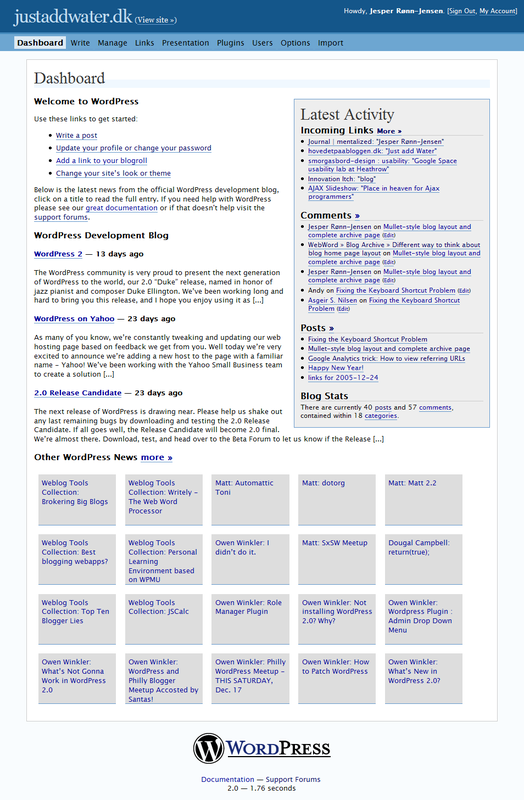 In particular, i think “Other WordPress News” are too dominant (although placed in the bottom below the fold). Only a few of the news are directly WordPress related. Other WordPress News could easily be replaced by a link to planet.wordpress.org (from which the news are taken). After all, this will lead to faster response times, and will probably make the Dashboard more relevant to users like myself that wonders what on earth “Owen Winkler: I didn’t do it” has to do with my blog. Add latest drafts to Dashboard. Maybe it’s just me. Usually I’m working on 2-3 stories that I save as drafts. I think that these should be on the dashboard as well. Here’s a quick mockup of the changes i propose. This entry was posted by Jesper Rønn-Jensen	on Thursday, January 12th, 2006 at 22:39 (GMT-1)	and is filed under AJAX, Blogging, Links, Web Statistics, WordPress. You can follow any responses to this entry through the RSS 2.0 feed. Both comments and pings are currently closed. Having one of the hnadful of WordPress-related-topics-only feeds on Planet WordPress, I’d like to think that my posts would be more read. But I’m willing to concede that maybe my feed isn’t relevant for everyone. I’ve been thinking about doing something about the Dashboard situation over the past week. Maybe one of my yet-to-come posts that appears in your Dashboard will help you solve your problems. Until then… Even so, I hope you still stop by my site for a read now and then. Hey Owen. No pun intended. I merely chose your post because I could not get the connection between my Dashboard and your blog post article. Sometimes posts occur in a completely different context where the title must explain more about the content in the post. In this instance, I have absolutely no clue what that title is doing on my Dashboard. I guess I should have picked on another of the posts, but my point is still that all of them should be removed as they are only occasionally relevant. And for sure, I’m not picking on you, I can assure you that! By the way, I might want to check out your Geo plugin while we’re at it. Jesper, you really want MeasureMap. It does most of what you’re asking for. Jared, I have an eye on MeasureMap, but unfortunately it’s still in closed beta. Besides I would rather my existing product change than to experiment with a new one. My top priority is still that I think Google should change a few things in the tool (and I think there’s room for it without really out-competing MeasureMap). As a matter of fact, I wrote a post recently (using Google Analytics to view referring URLs). That tells me that there is plenty of room to improve in some of the web-based statistics tools. With regards to the Dashboard your point i valid and I would like to add that i expect Dashboard functionality and statistics functionality to converge in the future. I probably go more into detail in a later post on what could improvee in Google Analytics. It seems also to work with the Sage plug-in for Firefox. Бесплатно обучаю работе с аукцином eBay. Работа на дому. Хотите зарабатывать по $2000 в мес. или даже $100 в день? У Вас есть возможность это сделать.